Meet Gabbie. She loves animals (especially horses), going to school, chatting with her friends on the phone, and singing in choir. She's an empathetic "old soul" who accepts people as they are and does whatever she can to help them work through problems. Gabbie has a fantastic sense of humor - dry and sarcastic - and rolls her eyes at her parents like any other teen girl. Gabbie has schizencephaly, hydrocephalus, a VP shunt, spastic quadriplegic cerebral palsy with some dystonia, sensory processing disorder, ADHD, asthma, GERD, sensory processing disorder, she has cognitive delays, and apraxia of speech. Her diagnoses are the result of a traumatic emergency that occurred during an ER visit when she was only 4.5 months old. She had to be life-flighted to another hospital, needed 2 emergency brain surgeries, and stayed in the hospital for the next 4 months on a ventilator needing daily MRIs/CAT scans and the treatment of multiple doctors. Today Gabbie needs assistance for all activities, uses a power wheelchair for transportation, an iPad and phone to assist with reading and writing, and a variety of other equipment – from braces, splints, and walkers to bath chairs and a special bed and sleep system to help her access her world and be her best. Gabbie's mom Sarah says that without Medicaid: "I never would have been able to pay even a portion of that bill, being a single mom. I wouldn't be able to afford her incontinence products, or pay the insane prices for any any equipment ( a bath chair alone costs over $500). My child wouldn't have access to have even her most basic needs being met (education, sleep, bathing, moving around in the world). Without the ACA, we wouldn't last long, and it's terrifying to imagine what would happen to us." In Gabbie's state of Michigan, Medicaid patients are now required to choose a privatized insurance company. Though she also has Children's Special Health Care and is on the HAB waiver her mother says they have not had a single service provided by the waiver in 3 years. Recently, Gabbie has become very interested in activism. 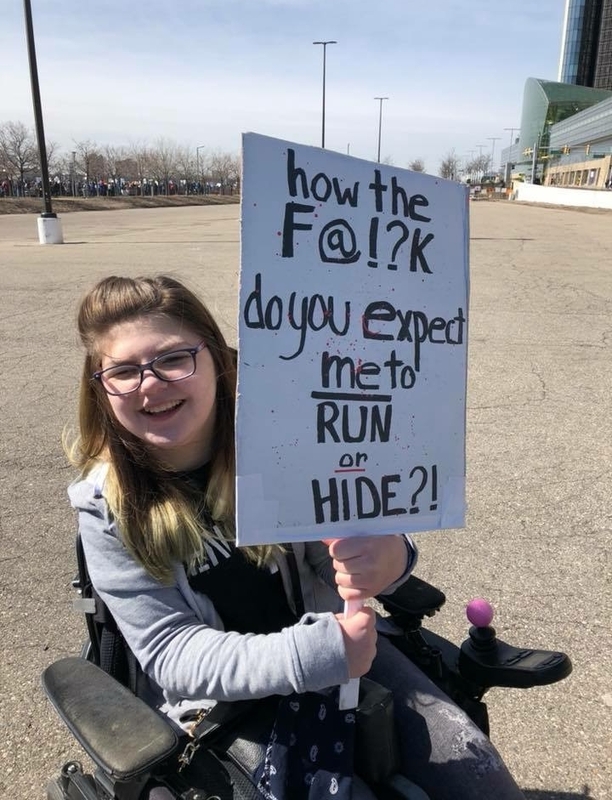 She has participated in school walkouts, the Women's March, and March For Our Lives, and has become very vocal about the Americans with Disabilities Act. Her mom says the ADA is not enforced as it should be: "Disability plates and placards are increasing, and yet the requirements for parking spaces has not increased, many businesses don't have the correct amount, or don't place them in the most directly accessible places as required by the ADA. Sidewalk cut-outs are either not put in, or in a location that is inaccessible. Buttons to open doors are placed in places where a person in a wheelchair could never reach. and stores are impossible obstacle courses. Our schools are not wheelchair accessible, tables are too short, not enough space in classrooms, old tiny elevators, stages with no access, too narrow doorways, field trips, class trips, parties and dances that aren't inclusive... yes, it's better than it used to be... but it's not enough and it's not enforced."